"How long will a bottle of Porto last once opened?" Why? There are 2 main Porto categories – Ruby to include our Ruby, Finest Reserve, LBV and Vintage and Tawny, to include our Fine Tawny, 10 Year and 20 Year Tawny. Ruby Portos are aged in large neutral wooden tanks (exception LBV) to preserve the intense dark red fruit as the name implies, and are to be enjoyed young or evolved with age (Vintage). Tawny Portos are aged in much smaller neutral wooden casks for many more years to result in an oxidized style, as the name implies, with completely different complexities of nuts and dried fruits, and does not need further bottle aging. Oxidation is an enemy to any bottle of opened wine, and Porto is no exception. However, the higher levels of alcohol and sugar in the fortified Porto better protects from oxidation once opened. Tawny, already oxidized from extended aging in wood, lasts even longer once opened. Here is Quinta do Tedo’s guideline for how long our Portos will last once opened, given that they are recorked and refrigerated. Fine Tawny, 10 YR Tawny and 20 Yr Tawny: 1 – 2 months. Already with a naturally oxidized and more concentrated style, the younger the Tawny the longer it will stay in the refrigerator after opened. Is there a reason why Tawny Portos are always the most popular choice on wine/glass program in a restaurant? Serve slightly chilled. Ruby: 2 weeks. Our young Ruby, a blend of 3 harvests aged 3 years average in wood, is made from younger and less tannic vines. Best chilled. 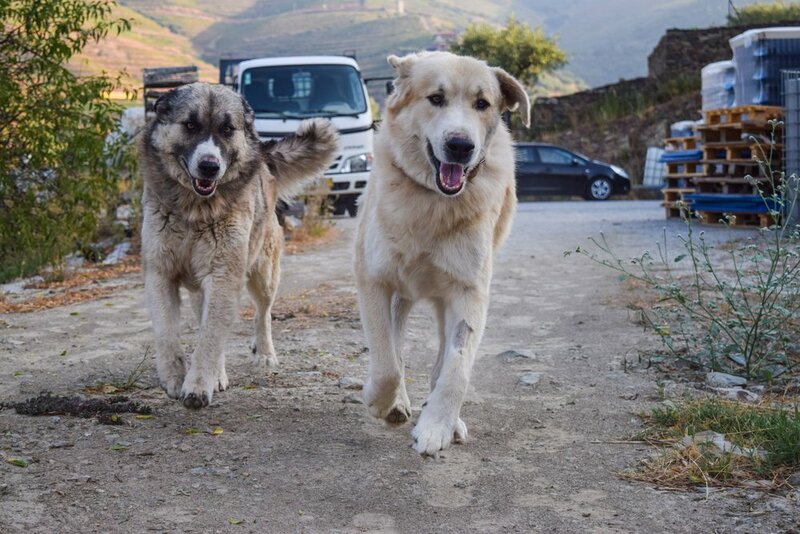 Finest Reserve: 3 – 4 weeks. Our “Vintage Character” (aka “Poor Man’s Vintage”) Ruby, selected from older parcels yielding grapes with more complexity, a blend of 3 harvests aged 4 to 6 years in large wood tanks, has firmer tannins and more grip. Take out of the refrigerator before serving slightly cooler than room temperature. LBV: 1 – 2 weeks. Husband Vincent refers to as an "good digestive”, aged in 500L pipas for 5 years, larger than traditional barrels, this Porto is a “pre-aged” vintage ready to enjoy. Take out of the refrigerator before serving slightly cooler than room temperature. Vintage: +1 week. Such a cherished celebratory Porto, to share with another/others, as you would a bottle of a Grand Cru or a wine you have been aging in the cellar for that very special occasion. Take out of the refrigerator before serving slightly cooler than room temperature. Our experience is the following: Portos disappear from our refrigerator at a much faster rate. Let us know if this has been helpful and cheers to the holiday season! At Quinta do Tedo we use cork for our wine stoppers. They come from the Quercus suber – aka cork oak, growing in southern Mediterranean countries. 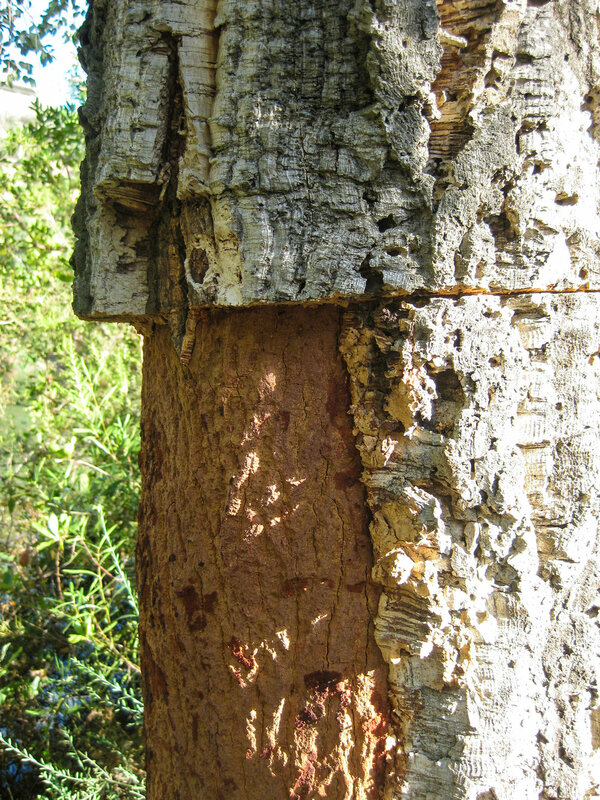 This tree has a uniquely thicker outer layer of bark, made of water-resistant cells, that separate the outer bark from the delicate interior bark. Rot, fire, temperature and water resistant, the outer cork layer survives temperature fluctuations, frequent droughts and fires and is also a material that ideally stops wine bottles. Harvested by hand using a long-handled hatchet, the cork layer is pried away from the tree and stripped off. This is done during the time of year when the weather transitions from colder to warmer temperatures – usually between late spring and early summer. At this time the trees “sweat” and the outer layer can be pried off. The thicker the bark the higher the quality the cork. Stripped of its bark, the slabs of cork are boiled in vats of hot water to soften, and cork stoppers are mechanically punched out. Portugal produces about 75% of the world's cork and is completely sustainable, as the cork layer naturally grows back every 8 - 13 years. The majority of cork forests in Portugal are located in the southern Alentejo region. A much smaller amount of cork trees are found in Douro Valley, to include along river Tedo. Today cork is fashioned into many design items, as anyone can see when visiting Portugal. From purses, to shoes and even to underwear (! ), as well as flooring and wall covering that provide effective acoustics, cork provides countless applications. Harvest started later this year, due to late Spring rains with cooler temperatures, resulting in a later fruit set. Even with summer temperatures above average (the hottest July on record!) the harvest started 7 September. Some parcels, notably Vallongo, were slow to reach the desirable sugar level for picking. Last lagar was emptied today! About 30% less in quantity this year, the berries are compact and tasty. The Quinta becomes a beehive of activity during harvest; grape arrivals throughout the day, the vineyard workers swell in size from 6 to 18 persons to pick the grapes, and for those who work in the cellar sleep is sometimes an after thought, especially when it is time to fortify the fermenting must into Porto! 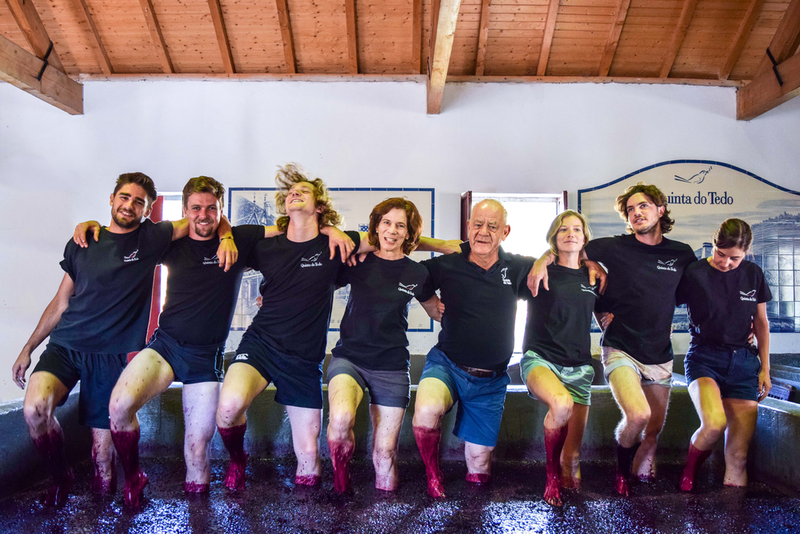 Visitors to our quinta peak during harvest, keen to watch first hand the steps in port making; there is always a request to participate in foot treading in the late afternoon. Another year of the grape vine’s cycle comes to an end and Port and our Douro DOC red wines are the result! Harvest anticipation! Refractometer measurements and juice samples are mandatory as well as a careful eye on the vineyard, as we wait to start. When the perfect balance between sugar and acid is met, the harvest kicks in. The shift in weather can already be felt that I associate with harvest time, and the crisp and cooler mornings will soon be the norm. The fact that July and August were torrid months would lead one to think that the harvest would start earlier, but the cooler-than-normal months of April, May and June result in a week’s delay. 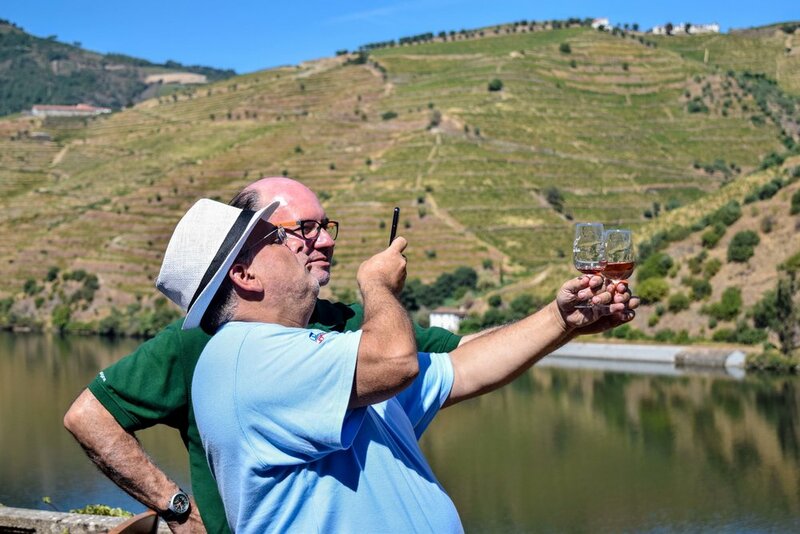 Also, the heavy and consistent rain of April and May promoted a poor fruit set – an average 35% less in the entire Douro Valley region. 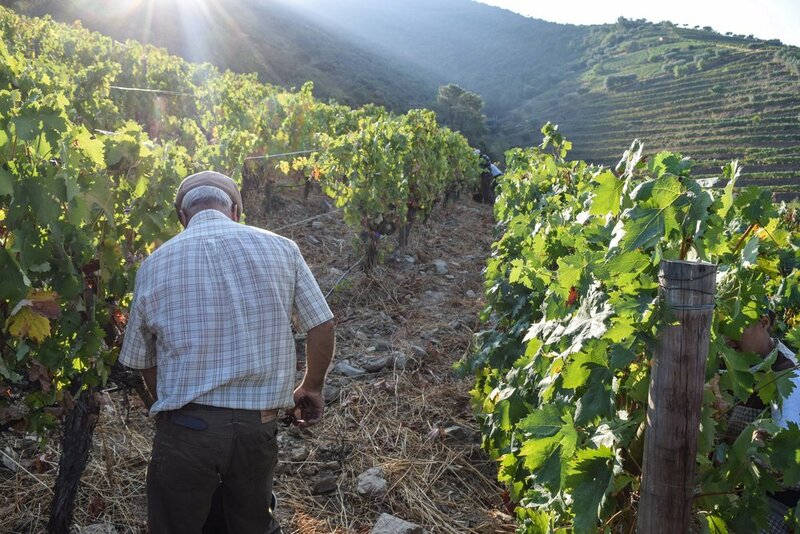 Our harvest at Quinta do Tedo will start the 2nd week of September. 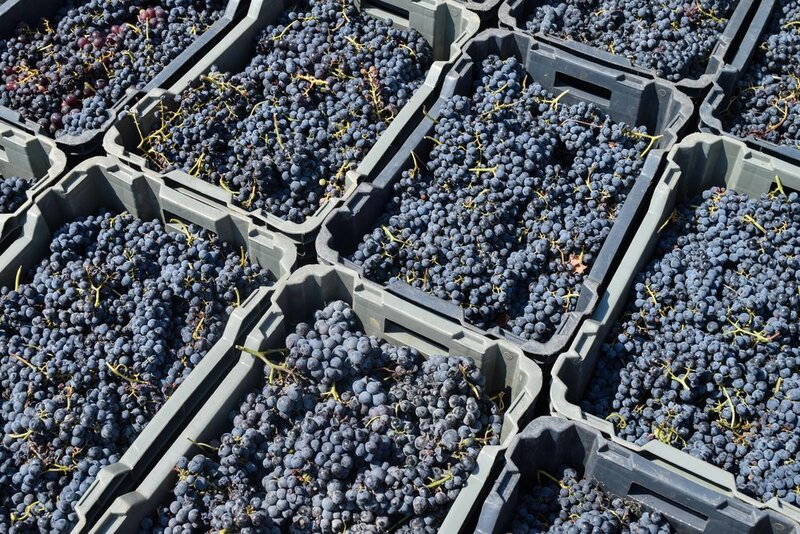 Even with the above challenges faced during growing season, the quality looks great; the grapes are healthy, small berries packed with concentrated fruit and very tasty. Once again the unique Portuguese grapes with their interesting flavors, deep colors, tannic structure and good acidity will be crafted into beautiful Portos and Douro DOC red wines at Quinta do Tedo. Estimation de la récolte! Des mesures au réfractomètre et des prélévements de moûts, ainsi qu’un oeil attentif sur les vignes, sont nécessaires pendant que nous attendons pour commencer. Quand un équilibre parfait entre le sucre et l’acidité est atteint, la récolte est lancée. Le changement de temps se fait déjà sentir et je l’associe au temps des vendanges et les matins frais et tonifiants seront bientôt habituels. Le fait que juillet et août ont été des mois torrides fait penser à chacun que les vendanges débuteront plus tôt, mais les mois d’avril, mai et juin plus froids que d’habitude prédisent une semaine de retard. Les fortes et persistantes pluies d’avril et mai ont contribué dans l’ensemble de la vallée du Douro à une pauvre nouaison, d’en moyenne moins 35%. A Quinta do Tedo notre récolte débutera la 2ème semaine de septembre. Malgré les défis cités ci-dessus rencontrés durant la saison de pousse, les raisins sont sains, aux petites baies d’un fruité intense et très savoureux. Une fois de plus les incomparables raisins portugais aux profils aromatiques intéressants, aux couleurs denses, à la fermeté tannique et à la bonne acidité vont être élaborés en de magnifiques Portos et vins rouges Douro DOC à la Quinta do Tedo.